Best Reference Sources for Doctoral and Master's Dissertations and Thesis in Library and Information Science; LIS Ph.D. and MLIS Thesis and Dissertations. General reference databases are listed first which is followed by the repositories and digital libraries of individual countries and universities. It also provides information on the online availability of electronic theses in the library and information science through centrally-maintained digital repositories which not only ensure easy access and archiving of doctoral theses but will also help in raising the standard and quality of research. According to Wikipedia, "A thesis or dissertation is a document submitted in support of candidature for an academic degree or professional qualification presenting the author's research and findings. In some contexts, the word "thesis" or a cognate is used for part of a bachelor's or master's course, while "dissertation" is normally applied to a doctorate, while in other contexts, the reverse is true. The term graduate thesis is sometimes used to refer to both master's theses and doctoral dissertations. The required complexity or quality of research of a thesis or dissertation can vary by country, university, or program, and the required minimum study period may thus vary significantly in duration." Theses and dissertations are known to be the rich and unique source of information, often the only source of research work that does not find its way into various publication channels. Theses and dissertations remain an untapped and under-utilized asset, leading to unnecessary duplication and repetition. E-Theses and Dissertations (ETD) store and provide access to theses and dissertations available in electronic form. This type of repository provides a platform for researchers to deposit their theses and dissertations and make it available to the entire scholarly community in open access. These repositories have the ability to capture, index store, disseminate and preserve electronic theses and dissertations (ETDs) submitted by the researchers. 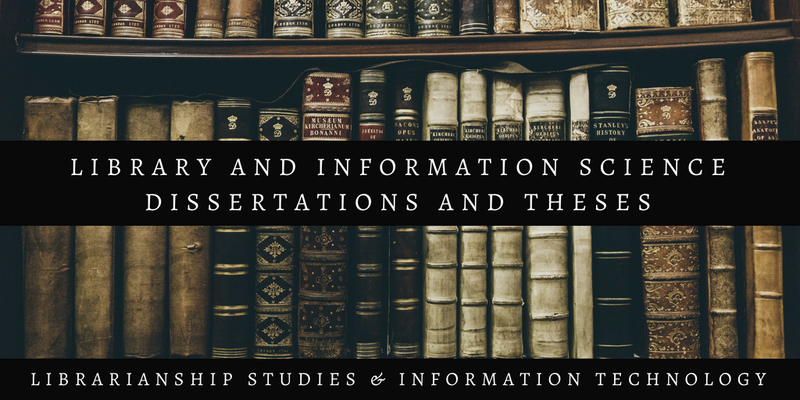 This entry Library and Information Science Dissertations and Theses is expected to be the most comprehensive listing of sources of information on LIS dissertations and theses. It will enable LIS researchers with wider dissemination of information leading to improved referral and citation. It will not only bring more visibility and greater recognition to the researchers and their work but also help improve their rankings. It will be of immense help to the researchers in the task of literature search and review of related areas. 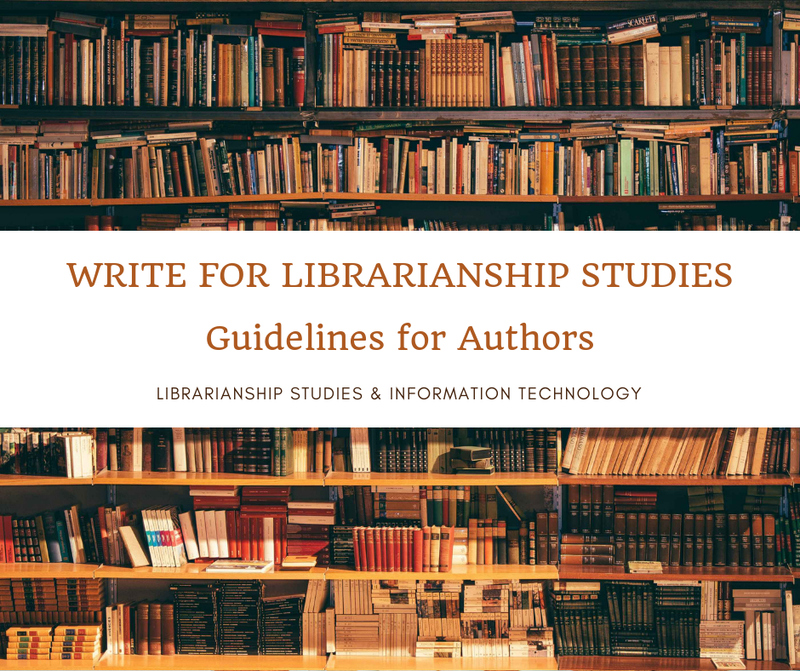 Besides the literature reviews, the availability of comprehensive sources of LIS dissertations and thesis will give information on research studies already undertaken which will also help future researchers in identifying and formulating the topic of their research. It will eliminate the possibilities for researchers ending up pursuing a topic of research that has already been undertaken at the same or other universities. ProQuest Dissertations & Theses - Subscription Required - The largest single repository of graduate dissertations and theses. Includes 3.8 million works – grows by 100K each year International scope – deposits from universities in 88 countries. Accessed by 3000 institutions – over 45,000 downloads every month. PQDT Open (ProQuest) - Free - PQDT Open provides the full text of open access dissertations and theses free of charge. You can quickly and easily locate dissertations and theses relevant to your discipline, and view the complete text in PDF format. EBSCO Open Dissertations - Free - EBSCO Open Dissertations now includes the content from American Doctoral Dissertations. It is a free database with records for more than 800,000 electronic theses and dissertations from around the world. It is a multidisciplinary database ideal for academic libraries. EBSCO Open Dissertations is a collaboration between EBSCO and BiblioLabs to increase traffic and discoverability of ETD research. You can join the movement and add your theses and dissertations to the database, making them freely available to researchers everywhere while increasing traffic to your institutional repository. This new collaboration extends the work started in 2014, when EBSCO and the H.W. Wilson Foundation created American Doctoral Dissertations which contained indexing from the H.W. Wilson print publication, Doctoral Dissertations Accepted by American Universities, 1933-1955. In 2015, the H.W. Wilson Foundation agreed to support the expansion of the scope of the American Doctoral Dissertations database to include records for dissertations and theses from 1955 to the present. 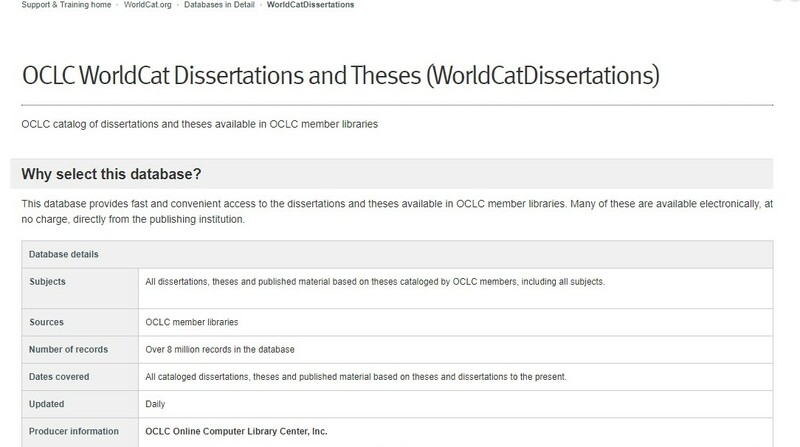 WorldCat Dissertations and Theses - Subscription Required - All dissertations, theses and published material based on theses cataloged by OCLC members and included in WorldCat. This database provides fast and convenient access to the dissertations and theses available in OCLC member libraries. Many theses are available electronically, at no charge, directly from the publishing institution. 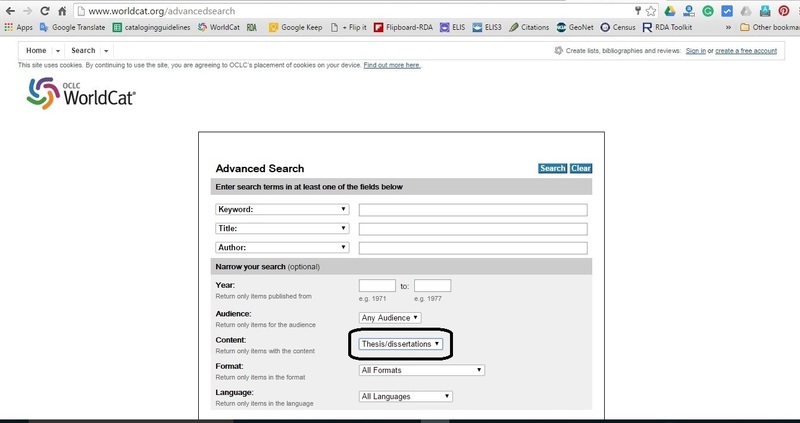 WorldCat.org - Free - In advanced search under the tab "Content" select "Thesis/dissertations" - WorldCat is a union catalog that itemizes the collections of 72,000 libraries in 170 countries and territories that participate in the Online Computer Library Center (OCLC) global cooperative. It is operated by OCLC Online Computer Library Center, Inc. The subscribing member libraries collectively maintain WorldCat's database. Center for Research Libraries - Free - Dissertations From Outside the U.S. and Canada (CRL) - In advance search select "Dissertations" in "Location" tab) - The Center for Research Libraries, a consortial library in Chicago holds about 750,000 foreign doctoral dissertations, but not all of them are cataloged. You can order the dissertations and other materials they own through Interlibrary Loan and keep them for a relatively long period of time. If you do not find the title you want, please contact the person dealing with publication requests at CRL: they will order those dissertations that are not already held. 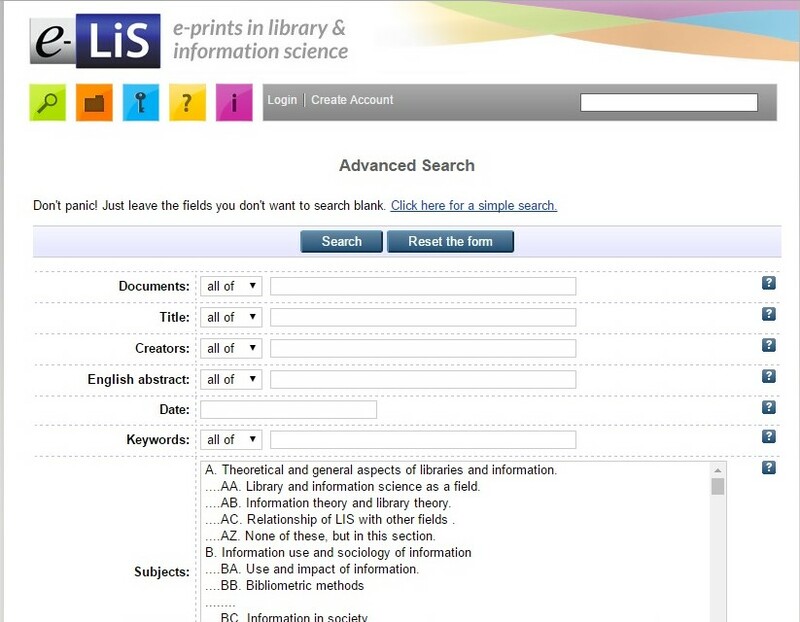 e-LiS (E-Prints in Library & Information Science) - Free - In Advance Search under "Item type" select "thesis" - Established in 2003, e-LIS is an international digital repository for Library and Information Science (LIS). It has grown to include a team of volunteer editors and support for 22 languages. The development of an international LIS network has been stimulated by the extension of the Open Access concept to LIS works and facilitated by the dissemination of material within the LIS community. These are some of the reasons for the success of e-LIS. In a few years, e-LIS has been established as the largest international open repository in the field of library and information science. 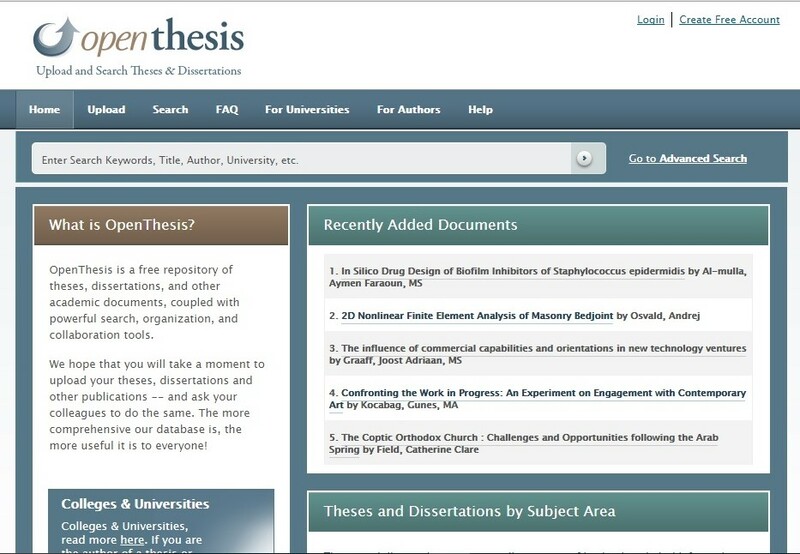 OpenThesis - Free - OpenThesis is a free repository of theses, dissertations, and other academic documents, coupled with powerful search, organization, and collaboration tools. Open Access Theses and Dissertations - Free - OATD.org aims to be the best possible resource for finding open access graduate theses and dissertations published around the world. Metadata (information about the theses) comes from over 1100 colleges, universities, and research institutions. OATD currently indexes 3,236,273 theses and dissertations. NDLTD (Networked Digital Library of Theses and Dissertations) - Free - The Networked Digital Library of Theses and Dissertations (NDLTD) is an international organization dedicated to promoting the adoption, creation, use, dissemination, and preservation of electronic theses and dissertations (ETDs). It supports electronic publishing and open access to scholarship in order to enhance the sharing of knowledge worldwide. 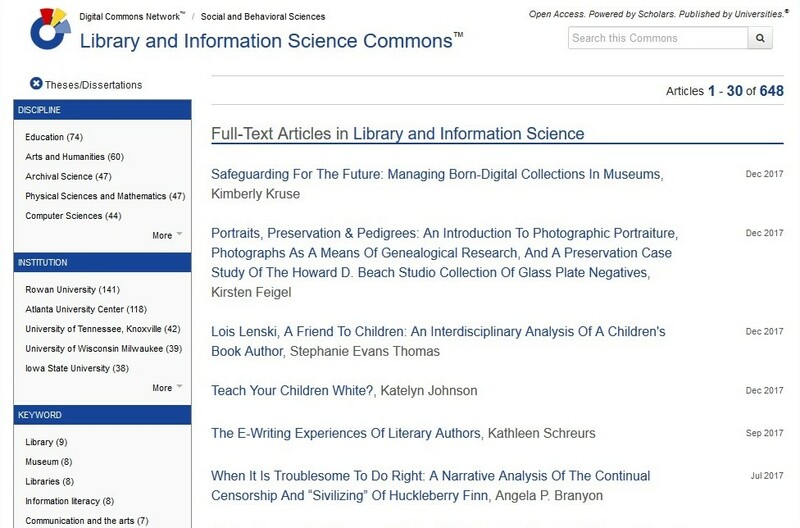 Library and Information Science Commons - Free - The Digital Commons Network provides free access to full-text scholarly articles and other research from hundreds of universities and colleges worldwide. 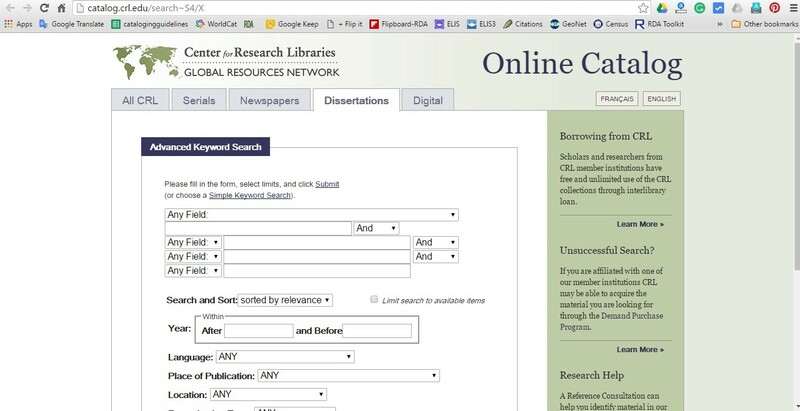 Curated by university librarians and their supporting institutions, this dynamic research tool includes peer-reviewed journal articles, book chapters, dissertations, working papers, conference proceedings, and other original scholarly work. Clicking "Explore" anywhere on the multicolored Discipline Wheel opens a Commons page for a particular academic discipline. From here, you may browse popular and recently added articles, search all content, or "Follow" authors and publications to receive monthly email updates on new work in that field. You'll never run into pay walls or empty records, because only full-text, open-access research and scholarship are included in the Network. The Learning and Technology Library (LearnTechLib) - Free- Dissertations for Information Science; includes bibliographical description and abstracts of dissertations chiefly from the United States. The Learning and Technology Library (LearnTechLib) - Free- Dissertations for Library Science; includes bibliographical description and abstracts of dissertations chiefly from the United States. IDEALS (Illinois Digital Environment for Access to Learning and Scholarship) - Limited Access: University of Illinois users only - IDEALS Home - School of Information Sciences - Student Publications and Research - Library and Information Science - Dissertations and Theses - Library and Information Science. Browse IDEALS by subject Library Science. Search Dissertations and Theses - Information Sciences. Carolina Digital Repository, School of Information and Library Studies - The Carolina Digital Repository (CDR) is a digital archive for scholarly materials produced by members of the University of North Carolina at Chapel Hill community. The main goal of the CDR is to keep UNC digital scholarly output safe, accessible and discoverable for as long as needed. Digital Library of Information Science & Technology (DLIST) - Free - Dissertations - The University of Arizona Campus Repository - There is a drop-down menu in front of "Search", select "UA Theses and Dissertation" - The UA Dissertations Collection provides open access to dissertations produced at the University of Arizona, including dissertations submitted online from 2005-present, and dissertations from 1924-2006 that were digitized from paper and microfilm holdings. Library and Information Science Theses and Dissertations - Free - This collection contains theses and dissertations from the Department of Library and Information Science, collected from the Scholarship@Western Electronic Thesis and Dissertation Repository. Indiana University, Department of Library and Information Science - Free - IUPUIScholarWorks is the institutional repository established to collect and disseminate IUPUI's scholarly output. Many scholars use to post dissertations and theses. The School of Informatics has a specific collection within the repository. UNT Theses and Dissertations - Free - Theses and Dissertations from University of North Texas Digital Library. Theses and dissertations represent a wealth of scholarly and artistic content created by masters and doctoral students in the degree-seeking process. Some ETDs in this collection are restricted to use by the UNT community. In the search you can filter by the type "dissertation or thesis." The University of Texas at Austin - Free - Browse University of Texas Electronic Theses and Dissertations by Department of Information. D-Scholarship@Pitt - Free - Institutional Repository at the University of Pittsburgh, United States. It may be searched for research works from its School of Computing and Information. Florida State University, School of Library and Information Studies - Free. Drexel University -- The theses & dissertations collection provides full-text access to Drexel doctoral dissertations since 2006 as well as selected older works and master's theses. Theses Canada Portal - Free - Guide to the 300,000 or so theses held in the Library and Archives Canada Collection. About 50,000 are online. McGill University, School of Information Studies - Free - eScholarship@McGill: theses submitted to McGill University in partial fulfillment of the requirements of the degree of Doctor of Philosophy (Ph.D.). EThOS e-theses online service - Free - The EThOS e-theses service is a free research tool giving you access to virtually all UK doctoral research. It’s an aggregated record of all doctoral theses awarded by all UK universities. And it’s a single point of access to the full text of as many theses as possible for use by all researchers. You can uncover existing research relating to your own area of study, download the theses you need to read, and find examples of well-structured theses and methodologies. You can find out about specific research undertaken at different universities, or see the research that academics have supervised. Over 450,000 theses are listed, covering PhDs and other doctoral degrees awarded by every Higher Education institution in the UK. University College London - Free - Theses are amongst the most highly-downloaded items in UCL Discovery. Making your thesis open access will mean that it is accessible worldwide, to anyone who wants to read it. Candidates for UCL research degrees are required to deposit an electronic copy of their final thesis in UCL's Research Publications Service (RPS), to be made open access in UCL's institutional repository, UCL Discovery. UCL Discovery, UCL's open access research repository, includes theses alongside other UCL publications. You can search for theses, or browse a list. City, University of London - Free - Browse by Year where Schools and Departments is "School of Mathematics, Computer Science & Engineering > Library & Information Science." Very good source as full text is available. Loughborough University, England, Institutional Repository for Information Science - Free. White Rose eTheses Online (WREO) - WREO is an online repository of doctoral theses from the Universities of Leeds, Sheffield and York. It is part of a national - and international - network of open access online databases which promote access to research outputs so that they can be found, read, cited and built upon. Under this browse theses of the University of Sheffield, Information School. DART-Europe E-theses Portal - Free - DART-Europe holds details of open access electronic theses stored in repositories across Europe. DART-Europe is a partnership of research libraries and library consortia who are working together to improve global access to European research theses. DART-Europe is endorsed by LIBER (Ligue des Bibliothèques Européennes de Recherche), and it is the European Working Group of the Networked Digital Library of Theses and Dissertations (NDLTD). The DART-Europe partners help to provide researchers with a single European Portal for the discovery of Electronic Theses and Dissertations (ETDs), and they participate in advocacy to influence future European e-theses developments. DART-Europe offers partners a European networking forum on ETD issues, and may provide the opportunity to submit collaborative funding applications to achieve DART-Europe's vision for ETDs. Shodhganga - Free - A reservoir of Theses from India - The Shodhganga@INFLIBNET Centre provides a platform for research students to deposit their Ph.D. theses and make it available to the entire scholarly community in open access. 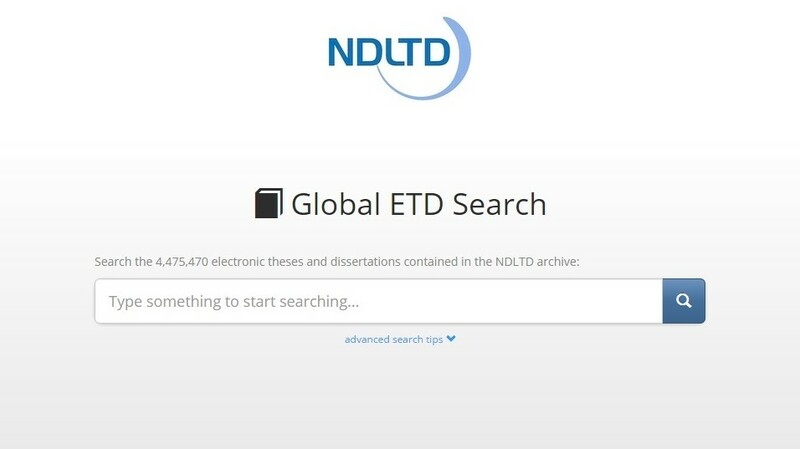 The repository has the ability to capture, index, store, disseminate and preserve ETDs submitted by the researchers. Electronic Theses and Dissertations (ETDs) - LIS Learning - Free - LIS Learning is a project by Aligarh Muslim University, Department of Library and Information Science which is funded by University Grants Commission (UGC) of India, New Delhi under its Major Research Project. They have compiled a collection of Electronic Theses and Dissertations (ETDs) done in the field of Library and Information Science in India which is available in the Shodhganga ETD repository and categorized by subject. LDL: Librarian's Digital Library - Free - A repository of theses and dissertations of Documentation Research and Training Centre, Indian Statistical Institute. University of South Africa, Department of Information Science - Free - Theses and Dissertations (Information Science). University of Pretoria, South Africa, Department of Library Services - Free - Theses and Dissertations (Information Science). University of the Western Cape, Electronic Theses and Dissertation Repository, Department of Library and Information Science - Free - Search limits facility available. Can be sorted by masters or PhD theses and dissertations. Trove - Australian Digital Theses - Free - A pre-defined search which limits the results to online Australian theses only. Trove includes theses at all levels, including PhD, masters and honours. DiVA Portal - Free - Theses from Scandinavian universities. Your Browser doen't support for Iframe ! Librarianship Studies & Information Technology blog thanks, Sandra K. Roe for suggesting some useful resources included in this list. Please suggest new resources be added to this list. Do you find it useful? If yes, then please share it with your friends and online network. "Sharing is Caring." Kindly provide your valuable feedback to make this entry more useful for the researchers of Library and Information Science. Sandra K. Roe, Librarian, Illinois State University, Editor, Cataloging & Classification Quarterly [July 17, 2016, e-mail] -- Wow. This is an amazing compilation, complete with search instructions - and such a great idea to solicit other sources from the community. Brilliant! Stephen Abram, Librarian and principal with Lighthouse Consulting Inc., and executive director of the Federation of Ontario Public Libraries [August 1, 2016, in his blog Stephen's Lighthouse] - Great list of sources – fee and free.